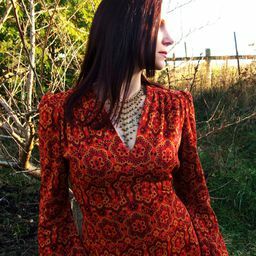 Taken during a photoshoot to sell items on Etsy. I'd scouted out this location, a famous historical Victorian known as The Pink Lady, because of how color-saturated the stained glass windows made it. I also thought that the pink of the house made it a very feminine environment, so we began to play with putting my model in the shadows, to make her a subtle, coy, almost wood-nymph type presence, while focusing on the outlandish colors of the glass. Date Uploaded: May 23, 2015, 6:43 a.m.